Today, our weekly Jewels in Motion post takes us back more than half a century, to the 1953 Nobel Prize Ceremony in Stockholm. 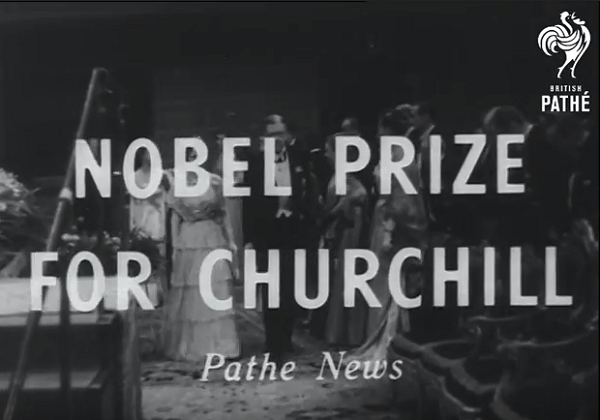 This particular Nobel ceremony got major press attention because Sir Winston Churchill was awarded the Nobel Prize for Literature. Here's a peek at some of the sparkly ceremony -- in motion! We get a good view of the major jewels worn by the Bernadotte ladies here. Princess Ingeborg wears an all-diamond tiara with fleur-de-lis motifs and strands of pearls. Princess Sibylla wears the aquamarine kokoshnik with a diamond riviere and the family's diamond arrow brooch (famously worn by Crown Princess Victoria as a hair ornament at her pre-wedding gala concert in 2010). Queen Louise wears the Leuchtenberg Sapphires. Princess Margaretha, who had recently turned 19, did not wear a tiara for the occasion. Prince Bertil, the king's son, was also in attendance; you can spot him here between Princess Margaretha and Queen Louise. Churchill was unable to attend the ceremony -- he was attending an international conference in Bermuda called by President Eisenhower following the death of Stalin -- so he was represented by his wife, Clementine. Lady Churchill was accompanied by her youngest daughter, Mary Soames, to Stockholm. During the banquet following the ceremony, Clementine read out a speech written by her husband for the occasion, and a choir of hundreds of Swedish students serenaded her with "Clementine." The ovation was so lengthy that Clementine wasn't sure whether to sit or stand!